Kerry forward David Clifford looks set to miss the first half of the upcoming league campaign. 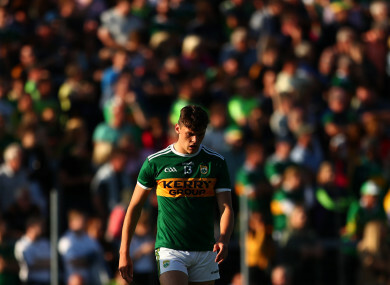 NEW KERRY BOSS Peter Keane must shuffle his pack for the first two games of the upcoming league campaign due to injures and player availability – including star forward David Clifford who looks set to miss out. Keane also cited club commitments and Sigerson Cup involvement as reasons why he would have to explore his options. As well as this, the 47-year-old confirmed that as of now the gates of Fitzgerald Stadium will be open to the public. The move was in an effort to appease Kerry supporters who still grate with Eamonn Fitzmaurice’s decision to shut the gates back in 2014 which resulted in the infamous ‘Treegate’ before the year’s All-Ireland final. As Kerry prepare to face last year’s beaten finalists Tyrone on Sunday week in Killarney, Keane will only to able to field a very experimental side. “Jason Foley picked up a knock and David Moran will not be back from his honeymoon,” he said. “[Moran] is back the day after the first game, but whether he will be available for our away game to Cavan is debatable. He’ll need time to settle in after being away for a month. Kevin McCarthy is unavailable with a broken hand, while David Clifford is also unavailable. Mark Griffin picked up a knock about a week ago and we hoped he might be OK. But amid all the doom and gloom, Keane confirmed that Tommy Walsh is back training and could well be involved against Tyrone. There is also over a dozen lads still in Sigerson Cup action, but the Kerry boss is hoping that some may be available to him. It’s a difficult one because you want them to play Sigerson football which is important for them. We have 13 or 14 players involved in Sigerson. “We have three involved on Sunday with IT Tralee; Gavin Crowley, Michael Potts and Dara Moynihan. Then we have lads in UCC, CIT and UL as well but both UCC and UL having come through and they will have a few weeks broken until 6 February. Players who may start include Shane Ryan in goal, Jack Sherwood at back with Peter Crowley, Paul Murphy, Killian Young and Tom O’Sullivan. The Na Gaeil pairing of Jack Barry and young debutant Diarmuid O’Connor could start in midfield, in the absences of Moran. Former wing back Jonathon Lyne may move to wing forward while Sean O’Shea, Paul Geaney and Stephen O’Brien look set to be chosen up front. Keane did reveal that he has strengthened his backroom team led by Jason McGahan, who is the new head of athletic performance. “We have Jason and Niall O’Mahony in charge of strength and conditioning. Chris Flannery and Podge Murphy are the two new physiotherapists in plus Colm Whelan. Keane acknowledged that there is a big difference between his roles as an All-Ireland winning minor manager to that of being the senior manager. “There is something going on all the time but I would say that there a good group around me even within the county board where you are getting help. As a successful businessman in Killorglin and supermarket owner, he admits people are happy to engage with him about all things Kerry football now. There are a way more people will come up to know wanting to talk football than when I was minor manager because I suppose minor football was very much under the radar. “It only came of an issue in July and August. It’s not annoying in any way because if I am feeling stressful in January it will get a lot more stressful I imagine as the year goes on. Email “Peter Keane confirms David Clifford is set to miss the first half of the league campaign”. Feedback on “Peter Keane confirms David Clifford is set to miss the first half of the league campaign”.